This blog post is part of the Strong Families Mama’s Day Our Way celebration. You can read more posts in the series on the Strong Families blog. Backline is proud to be a member of Strong Families, a national initiative led by Forward Together to change the way people think, act and talk about families. 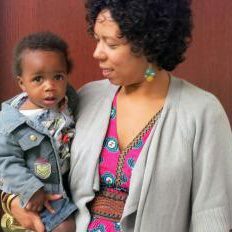 I always had this vision of myself in motherhood as a revolutionary, holistic, organic afro-centric, hippie mama. Motherhood challenges me and pushes me to relive my own childhood, while inspiring me to create a better one for my six children. Society paints a much different picture of black motherhood than I’ve experienced. The “mammy” “jezebel” and “sapphire” stereotypes are in full effect and are played out on reality T.V. They portray sistas as “black welfare queens” overpopulating American cities as a way to deny mothers of color access to many human rights. When black breastfeeding rates were on the decline, white breastfeeding rates were on the rise. The pendulum swung from black women nursing white babies as well as their own to reluctance or feeling the pressure of being a sole provider. By the 1970s the spiritual midwifery movement happened and many Black latctivists were on the decline due to more women being in the workforce and formula companies slinging artificial milk to the new independent mama. My choice to breastfeed my own children in many ways is an act of revolutionary love and protest of my ancestors having to wet-nurse white babies. Black feminism in the works. I had my first born 12 years ago and struggled with getting the latch right and fought my way through engorgement and soreness. Being a goddess mama and giving formula for me did not occupy the same space. I felt I would be a sellout to attachment parenting. As a single mom I did breastfeed, but doubted myself at times and what my body could provide, so occasionally I gave into formula. Why must a mother feel a sense of failure because she can’t breastfeed or simply gives into social pressures? By my second child, I was so stressed that I nursed her for 5 months and quickly gave up. I was living in the south and having to work, with little to no support. It was ridiculous that I worked at a hospital and couldn’t locate a lactation room. It wasn’t until I stopped pumping that I was able to find one. Needless to say I stopped breastfeeding my baby girl; I felt defeat and guilt for not providing her the same duration of nourishment at my breast as her brother. This mama guilt intensified later on in life as she developed a thumb sucking habit and asthma. By my third child, I was working as a breastfeeding peer counselor and was determined to go hard or go home with this breastfeeding thing. I had a wonderful home birth and was with a partner that had experienced his sons being breastfed and was supportive. He expected nothing less for our new addition but the breast. I had experience as a doula and peer counselor and knew all the benefits of breastfeeding. I had plans of bringing lactating back as the norm to the African American community in Oregon. I can tell you that this image of the black Madonna and my pride haunted me on challenging days; kept me pushing through raised eyebrows from family and questions of why a progressive working women like myself would not choose to just give in and give formula. I remember at my son’s first birthday, I received many questions from family and some friends of when was I going to give it up. He must be done by now. My reply was, when he is ready he will let me know. I get to start all over again as my family will welcome a little girl into our family of seven in June. We’re almost at Sekou’s second birthday and we are still nursing. The fact that my body helped his to grow without any artificial milk makes me proud. Breastfeeding is truly a family thang as it is the norm for my older children to see babies in laps nursing and they don’t second guess the magic that happens at the breast. They can recognize when their brother needs to breastfeed and brings him to me. My 12-year-old promotes breastfeeding at his environmental school and my daughter sneaks my books off the shelf about being a doula and the food of love. There is something about Sekou’s brown eyes looking into mine and the special bond we have that requires my spirit to sit and settle into my role as all my babies Mama. Shantae first joined Backline in 2010 as a Talkline Advocate and now serves on the Board of Directors. She currently works at WIC as a Breastfeeding Peer Counselor and is also a certified Full Circle Doula with A Mama Like Me Doula Service. Shantae is also a parent/ healer, chef and referee to 5 beautiful children. On her off time she enjoys having dance battles in her living room with her children, camping, hiking, and knitting.